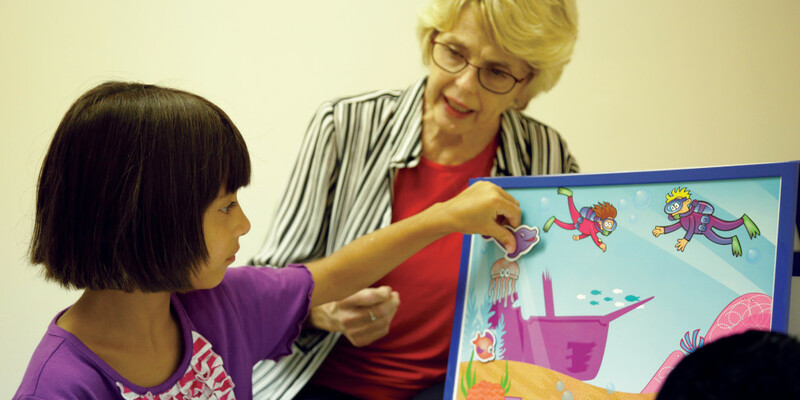 That question was the catalyst for the creation of the Speech and Language Pathology (SLP) Clinic at Faulkner University, which serves families in the Montgomery, Alabama, area at no cost. The clinic opened in July 2018 and has a goal to establish a comprehensive autism center on the campus by the end of 2019. The need for such care in the church is great. In July, Christianity Today highlighted recent research that found a child with autism was twice as likely to never attend religious services compared to a child with no chronic health conditions. Children with developmental delays, ADD/ADHD, learning disabilities, and behavior disorders were also significantly more likely to never attend religious services. Though Faulkner’s clinic is only just underway, its staff is already open to seeing patients diagnosed with speech, language, cognitive, and swallowing disorders. The clinic rooms are creatively designed with fun themes for different age groups. The rooms also come with adaptive equipment and seating to accommodate the patient’s needs. The tools and equipment in each room are safeguarded for infants, toddlers, and children alike. This is one of two purposes for the clinic, says Dr. Leah Fullman, director of Faulkner’s speech and language program and the SLP clinic’s founding director. Waitlists at local healthcare providers in the area can be six to eight months long, she says, and so Faulkner sees an opportunity to serve the community, particularly those who are uninsured or underinsured, and provide care for both the patients and their families. The clinic’s second purpose is to support Faulkner’s various degree programs in health, including its newest graduate program, a Master of Arts or Master of Science in speech language pathology. As a teaching clinic, faculty and graduate students will work together to coordinate plans of care and services for the patient, providing key experience for students looking to fill in the gaps of needed care in this area. Demand for the new program has been high, Fullman says, in part because of the program’s unique approach to learning. “During the first year of the program the students will rotate among the attending faculty in the clinic to get a comprehensive learning experience to best prepare them not only for their licensing exam, but also to be interdisciplinary healthcare professionals,” she says. Ryan Slaughter is a student at Princeton Theological Seminary and served as the CCCU’s 2018 summer fellow in public policy.